Dr. Raymond Alf, perhaps the greatest educator in the history of The Webb Schools, was an incredible educator and coach who lived on campus for nearly 70 years. Alf was born in China to missionary parents, and then became a nationally ranked collegiate sprinter, a renowned paleontologist who won a multitude of teaching awards, an inspirational motivator to generations of Webb students, and a man who founded the world’s only nationally accredited paleontology museum on a high school campus. 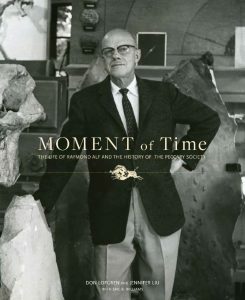 To tell Alf’s story and honor his legacy, Museum Director Don Lofgren and Jennifer Liu ’05 (Webb’s current Director of Parent Relations & Special Events) wrote “Moment of Time: The Life of Raymond Alf and the History of the Peccary Society,” a definitive treatment of Alf’s life and the museum that bears his name. The book was based on extensive research. Alf’s daughters (Janet & Mimi), his five grandchildren, and eighty of his former students and acquaintances were interviewed. Eric Williams, the Alf Family archivist, provided access to hundreds of family documents, diaries, and photos. The book has 15 chapters:1–6 are centered on Alf’s childhood, track career, and early years at Webb; 6–11 describe the peccary trips, Alf’s unbounded enthusiasm for teaching, and the establishment of a permanent museum at Webb; 12–14 recount his later years when Ray and his wife Pearl lived in a house on the Webb campus built specifically for them; and 15 reviews Dr. Alf’s incredible Webb legacy. A complimentary copy of the book is available to anyone who donates $100 or more to the Raymond M. Alf Museum of Paleontology. To do so, please use this link. 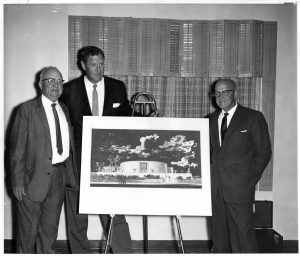 Webb School founder Thompson Webb, trustee Robert Reynolds, and Ray Alf pose with the design of the new Raymond M. Alf Museum. Construction was complete in 1967, and it was dedicated to Alf in November 1968. 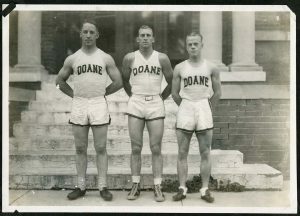 Ray Alf (right) was a national ranked track sprinter at Doane College (Nebraska) in the 1920s. 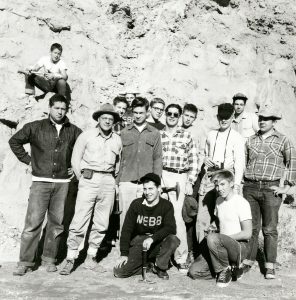 Webb Peccary Trip fossil collecting group at Barstow (California) in 1954. Alf is standing second from left. 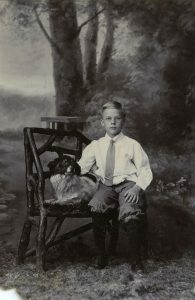 Ray Alf with family dog in Canton, China, c.1916.